The prices shown are for the most commonly requested portraits. I can provide everything from a simple sketch to a finished 'classical' portrait. Pet portraits from photographs are my speciality. If you don't see what you're looking for please contact the studio to receive personal attention and get a quote for a range of portrait options. All prices given are for paintings in oil on linen. Works in pencil on paper are also available. 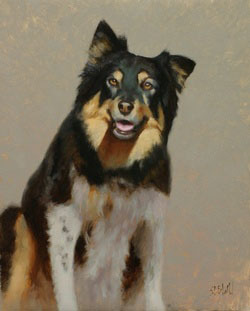 Delivery on most pet portraits takes about three months. Sketch portraits are small studio paintings that are done from your own photos and are completed over the course a few days in the studio. Payment in full is requested in advance. 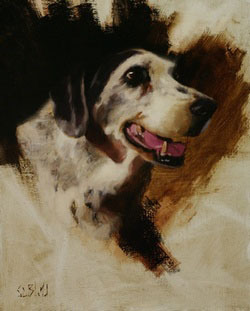 Formal pet portraits are larger paintings that usually involve at least a week of studio time. A deposit of 50% is requested, the balance is payable on delivery and acceptance. To allow us to offer you the greatest flexibility, oil portrait commissions of an individual person or family group are priced on request. Please contact the studio to receive personal attention. We'll give you a quote for a range of options for paintings in oil on linen. Works in pencil on paper are also available. Portraits of people are individually handcrafted to meet your needs and usually involve many days of work in the studio. 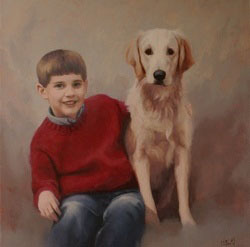 People and their pets can also be painted as a group. Portraits can be created from your own photos in some cases. Delivery may take up to six months.